Ballplayers are a superstitious lot at times. Or, as Michael Scott would say, they aren’t superstitious but they are a little stitious. Number 13 is available, you say? That’s OK, I’m sure 19 or 27 or 99 will work much better for me, thanks. No, it’s no trouble at all…..
You’ve probably noticed that most every other number has been worn by 35-50 people, unless they’ve been retired or taken out of commission. Yet fewer than two dozen people in the 123-year history of the St. Louis Cardinals have been brave enough to put the number 13 on their back. For whatever reason they have an aversion to it. Now, to be fair, it’s become more popular in the last few years, as 11 of the 18 folks have donned it since Tony La Russa came to St. Louis. Perhaps that’s because the natural inclination to take a low number (and there aren’t many of them still available in STL) overcomes whatever triskaidekaphobia players might have. And it’s not like it’s a cursed number in St. Louis. OK, sure, not a lot of great players have donned it, but it’s not like anyone was really good somewhere else and then went to pot after selecting that number here. You have the Fasseros and the Sidney Ponsons and Jose Vizcainos, but they never amounted to much in or out of St. Louis (well, I guess Fassero did have a fairly middling career) and you couldn’t pin that on the number. It’s possible that the current occupant, Mr. Carpenter, will erase whatever stigma might go along with that and we’ll see many more folks with that number in the years to come. While you might expect me to look at Carpenter in this, being that he’s been the most successful 13 in Cardinal history, I want to talk about the man that upset Chris Carpenter and lived to tell the tale. There aren’t many that can do that, though it’s probably only because Carpenter was feeling merciful more than any natural skill Brendan Ryan might have had. This incident, plus Ryan’s natural hyperness that didn’t necessarily mesh in the focused Cardinal clubhouse (and the fact that, at times, he could have fallen out of a boat in the middle of the ocean and missed the water because he couldn’t hit anything) tends to overshadow what Ryan did do in the clubhouse. For one, he did have some stretches of offensive adequacy. In 2009 he had an OPS+ of 97, which is just a shade under average. 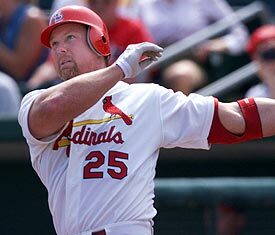 He hit nine home runs in the four years in St. Louis, which isn’t a slugger by any means, but was well in line with pretty much anyone that played the position between Edgar Renteria and Jhonny Peralta. What kept him here–and keeps him in the bigs, really–is his outstanding glove. 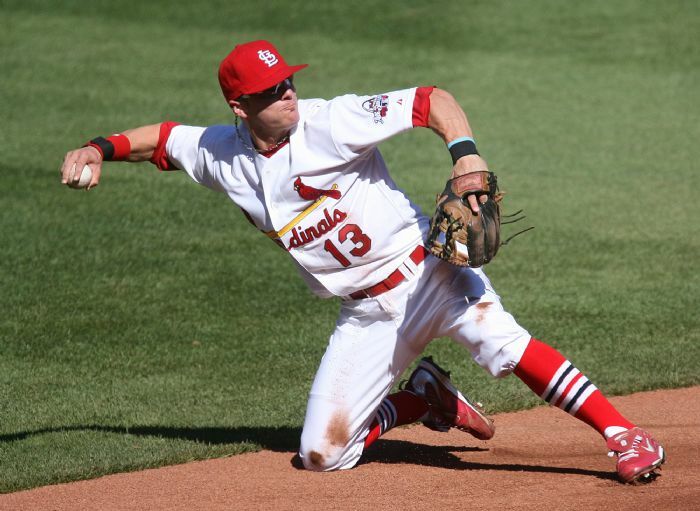 While most of the highlight reels are from after he left the Cards, he still put on some dazzling performances, which is one reason he got to wear 13 for four years. The Cardinals have a well-deserved legacy for defensive greatness and Ryan fit right into that, even if at the end it wasn’t enough to keep him on the club. In some ways, Brendan Ryan foreshadows Pete Kozma. Kozma, also, has a strong glove and not much else, though he’s had his moments (and is having a good spring). Unlike Ryan, the Cards are doing everything they can to keep him around, probably because he doesn’t bug his teammates like Ryan could do. (Even if he had the same personality as Ryan, Carpenter and folks like Albert Pujols have moved on, so I think the clubhouse could tolerate it a bit more.) Defense is always going to be important to St. Louis, even if it’s not the overarching theme that it used to be. Ryan illustrated that. No matter what, though, you can’t go wrong with a guy that can do things #whilespinning.